When the weather turns cooler and daylight begins to shorten, a carpet of brilliant leaves blankets the ground. Wild mushrooms pop up seemingly overnight, acorns crunch underfoot, and our thoughts turn to feelings of gratitude. Forest Floor: Autumn welcomes those harbingers of Fall with open arms! This set includes woodland botanicals, a geometric frame, and a handful of sentiments ideal for expressing your appreciation for the season. Pair these images with the coordinating dies to create projects with dimension and style. STAMP DETAILS: This stamp set comes on one 4 x 6 acetate sheet. The “Grateful” sentiment measures 1 ⅝” wide by just over ½” tall. The assembled white oak leaf measures just under 1” wide by just under 1 ⅞” tall. The assembled mushroom measures just under 1 ¾” wide by 2” tall. The frame measures 2 ⅖” wide by 1 ½” tall. The assembled shorter acorn measures just ½” wide by ⅝” tall. 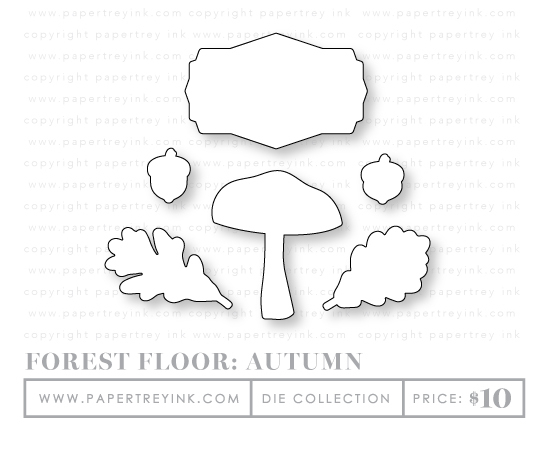 The Forest Floor: Autumn die collection coordinates with the images and frame in the Forest Floor stamp set. DIE DETAILS: Contains a total of 6 dies. The landscape changes by the season, and there are always new things to be found along the fence line! 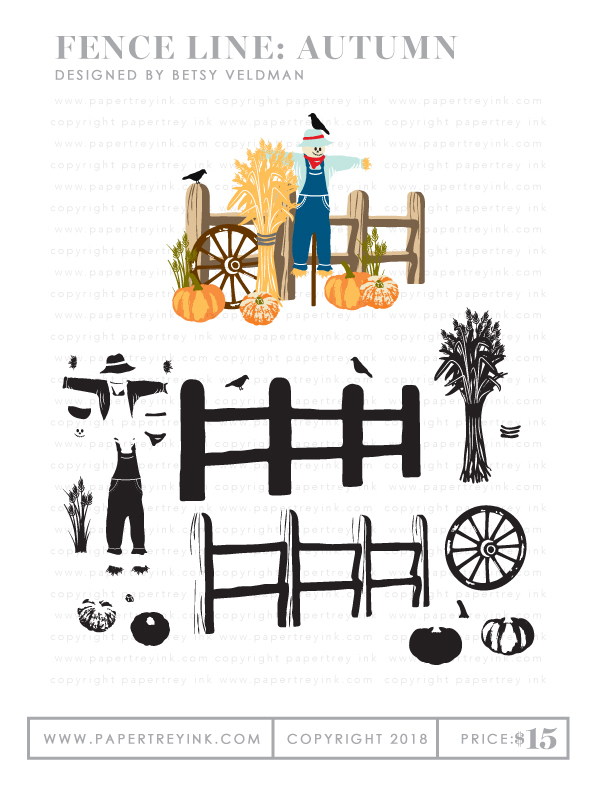 The Fence Line: Autumn set features a rustic wooden fence, complete with pumpkins, autumn grasses, corn stalks, a wagon wheel, and an adorable scarecrow! Perch the crows on the scarecrow’s hat or fence for a touch of whimsy. 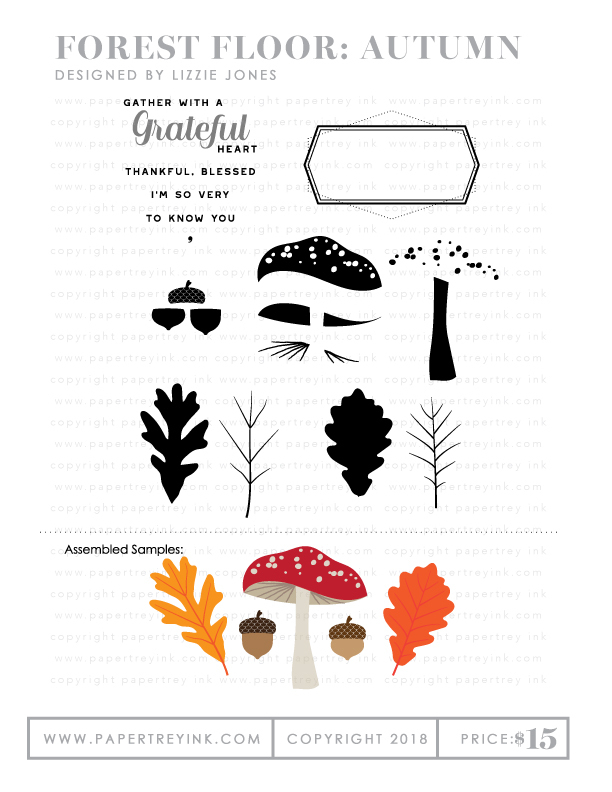 Have fun building scenes with this set, perfect for autumn birthdays, thinking of you, thanksgiving projects, and more! STAMP DETAILS: This set comes on a single 4×6 acetate sheet. The fence measures 3-3/8” wide and 1-5/8” high. The assembled scarecrow measures 1-5/8” wide and 2-1/2” high. The cornstalk bundle measures 1” wide and just under 2-1/2” high. The wagon wheel measures 1-1/8” in diameter. The larger pumpkin measures 3/4” wide and 5/8” high. The smaller pumpkin measures 1/2”. The grass cluster measures 1/2” wide and 1” high. 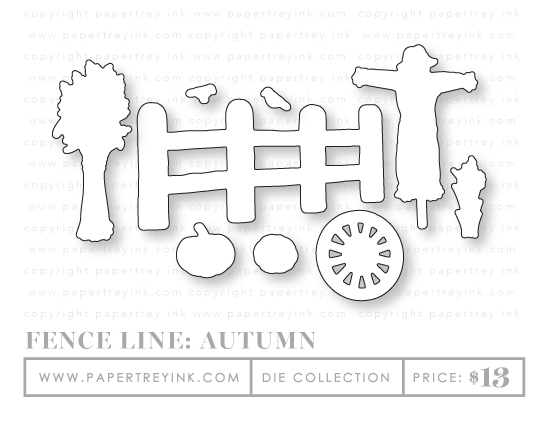 The Fence Line: Autumn die collection consists of 9 dies, and coordinates with the Fence Line: Autumn stamp set, allowing you to easily layer the grass, wagon wheel, pumpkin, and more, over the fence for pretty, dimensional effects. 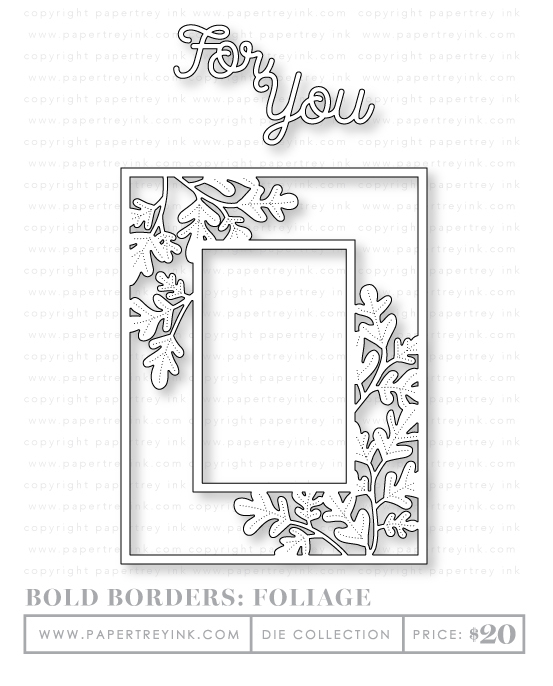 This Bold Borders features a cascading oak leaf design perfect for your autumnal creations. The pattern features pierced vein details to give the leaves just a touch of definition and texture. Included with the frame is a large-scale “For You” sentiment die that you can use with the Bold Borders frame or on its own. Pair the frame with sentiments already in your collection for a clean and simple project that comes together in no time! You’ll love how easy the Bold Borders make creating a card. The collection will be available in Ocean Tides on August 15th.